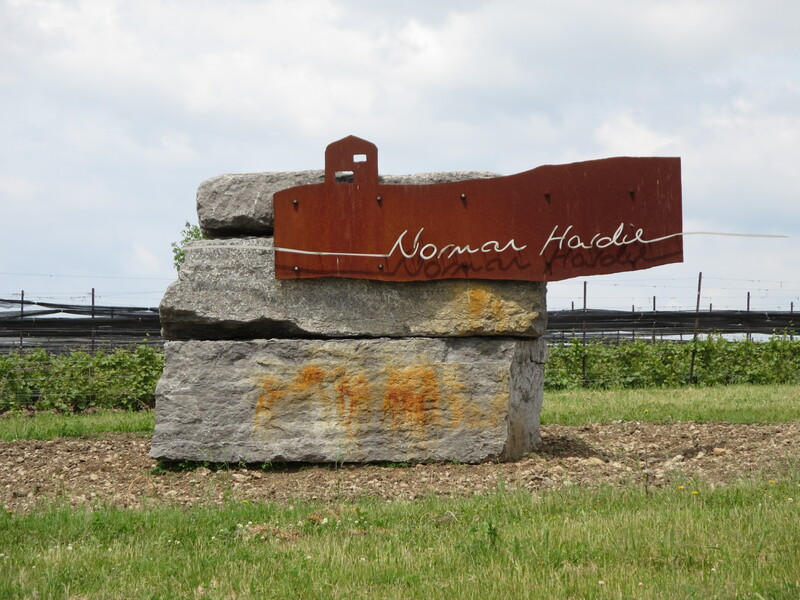 A few weeks ago I was in Prince Edward County and I did a blog post about some new discoveries there. In that post I mentioned that I’d do a follow-up post about that trip – so here it is. First, a confession: I love the County (as locals refer to Prince Edward County). It has a very special vibe. It’s a strange combination of rural, colonial, and hip, but unpretentious. The folks I’ve met while visiting have all been friendly, without being particularly outgoing. My guess is that they just like the County and are happy to have people visit – but they don’t necessarily want it over-run with tourists, so they keep a kind of low profile. 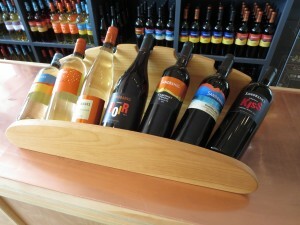 As for the wineries, there are over 30 to choose from. As I’ve noted elsewhere, in touring County wineries, one of the first things you might notice is how many of them are housed in handsome old barns. Indeed, some of my favourites are: Closson Chase, The Grange of Prince Edward County, and Karlo Estates. But, of course, plenty of wineries are housed in other facilities – some of which are newer and specially built (like Keint-he Winery and Vineyards and Sandbanks Estate Winery, and Huff Estates). 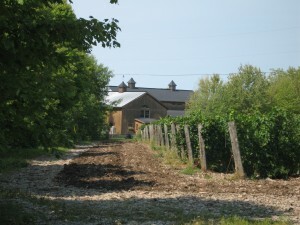 Sandbanks Estate Winery is one of three in a row on the Loyalist Parkway (Highway 33). You can’t miss it – it’s the one with the colourful Muskoka chairs on the patio. The cheery colours and casual atmosphere of the tasting room and wrap-around patio really make you think you should sit down and enjoy a glass. The place I stayed (Isaiah Tubbs Resort and Conference Centre in Bloomfield) had given me a voucher for a formal wine tasting at a few different places, and the one I decided to try was Sandbanks. My rationale was simple: I’ve noticed Sandbanks wines on various restaurant wine lists, as well as at the LCBO, so I wanted to taste some of their wines to know which I might order or buy when I see it in Toronto. It was great to taste some of their summer sippers (like Dunes, which is a Vidal, and Shoreline, which is a Chardonnay-Riesling-Gewürz blend). Of course, I also tried some reds and I ended up leaving with some of their 2013 Baco Noir (which I’m pleased to say is something I can pick up at my local Vintages – and which I see is on special right now). 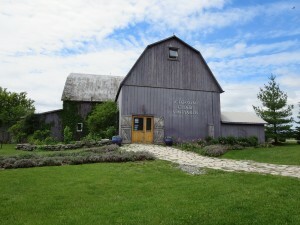 I also stopped in at The Grange of Prince Edward County. As I mentioned, it is one of my favourite wineries to visit. I fell in love with this winery the first time I visited. The property just has a very special feel – you really get the sense that the Granger family takes their stewardship of the old farm quite personally. The barn is beautiful – both inside and out. Though I didn’t have an appointment, I was hoping that winemaker Caroline Granger might be there – and she was. I had met her at a wine tasting before, so I knew she was passionate about the winery and her wines and I was interested in hearing her talk about the farm. She graciously agreed to let me shoot a short video of her. I’m so glad that she did, as she waxed poetic about the farm, community agriculture, terroir-driven wine and food. Click here to watch the video. I also stopped in to say hello to Bryan Rogers at Keint-he Winery & Vineyards and Norman Hardie, of Norman Hardie Winery. Keint-he has ex expanded their patio and Bryan tells me they are planning on participating in the Farmer’s Market program, though I don’t have any specifics about dates or markets they’ll be at. The pizza oven at Norman Hardie was already up and running for the season, and Norman will be participating in the International Cool Climate Chardonnay Celebration (i4C) in Niagara in mid-July.